Rilwan Mahmoud | K. K. Eleja & Co. He graduated from the University of Ilorin in 2011 with LL. B Combined Honours in Common and Islamic Law. He was then admitted to the Nigerian Bar in 2012 and subsequently underwent his mandatory Youth service programme at Abdullahi Ibrahim & Co., Abuja. He joined the law firm in 2013 and has been in active legal practice since. 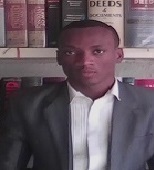 He is currently undergoing his PhD in law in Kwazulu Natal University, South Africa.